Home » Tech Tips » Browsers » How to Block Websites in Google Chrome? 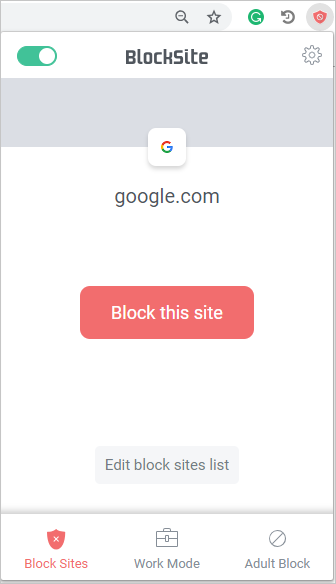 How to Block Websites in Google Chrome? The internet is a public domain and has every type of websites. Users prefer to block a website because it can be a cause of distraction for them. Though blocking a website is one of the most needed features, most of the popular browsers don’t have built-in option for this. Google Chrome users have couple of methods to block a website. You can use the hosts file in Mac and Windows or use one of the extensions from Chrome Web Store. The extensions tend to have additional features than blocking though operating system. Parents can also use this feature as parental control and hide negative content from the children. Follow the below instructions to block certain websites using hosts file in Windows 10. First ensure you are logged in with administrator account. Type notepad in Windows search box. Right click on the Notepad app and choose “Run as administrator” option. You need to confirm the “User Account Control” popup to allow the access. When you are in Notepad app, press “Control + O” keys to open a file. Navigate to “C:\Windows\System32\drivers\etc” folder. We assume you have installed Windows on C: drive, otherwise change C: drive to your installation drive. Select “All Files” option and open hosts file. Let us say, you want to block “www.bing.com” on Chrome. Add the below entry at the end of the file. Save the changes to the file. You can either use space or tab between the IP and the website address. 127.0.0.1 is a localhost address and Chrome will block bing when you try to open. Sometimes you may need to flush the DNS or restart the computer for the changes to take effect. On Mac, you can go to Terminal app. Type the following command and enter the admin password to open hosts file. Add the entries as explained above to block websites. Blocking websites through hosts file may not work in some cases. So, you can use extensions in order to simplify the process. Also, some extensions provide more than just a simple blocking feature. 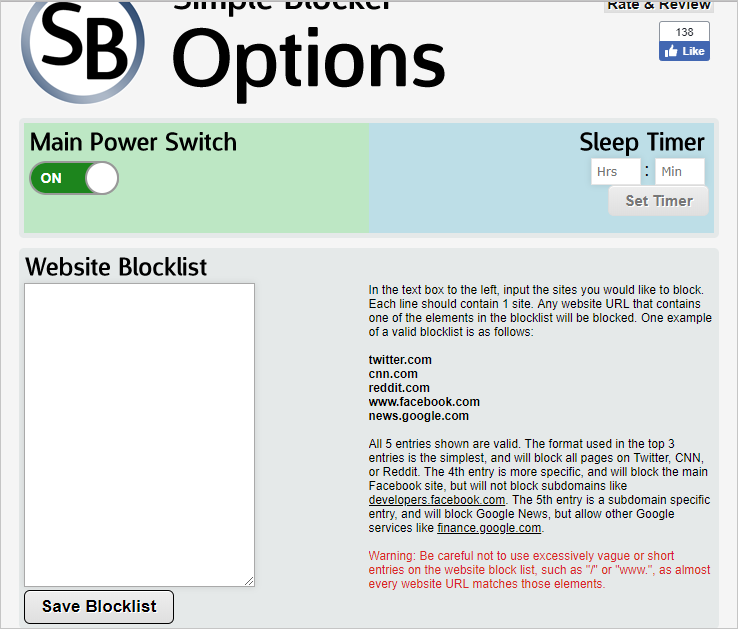 Block Site is the most famous website blocking extension available on Chrome Web Store. This extension is simple to use for restricting websites, however it has much more use than that. 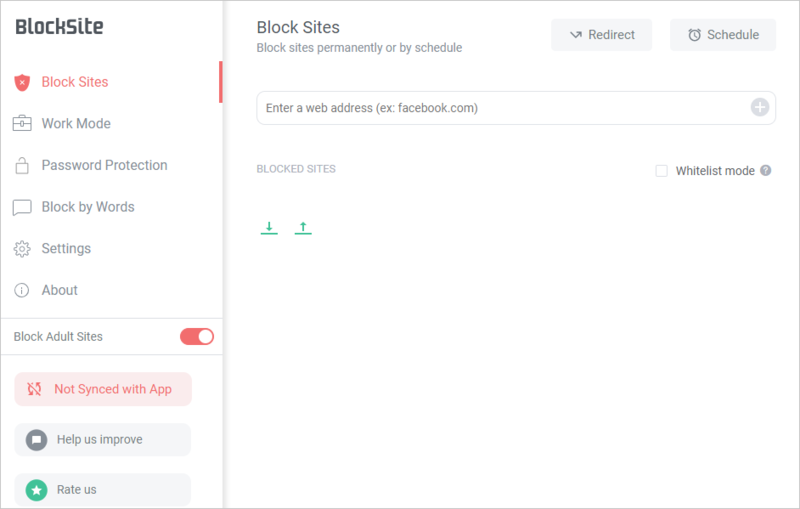 You can maintain a block list, use a keyword to block websites and block during a specific time. The extension also has a sync feature. It helps to block the undesired websites from all your devices. Using this extension is fairly easy. Add the extension to Chrome and click on the icon of the extension. Clicking on “Block this site” button will restrict the currently opened website. The “Work Mode” restricts website for a certain period of time while the “Adult Mode” restricts all types of websites that have adult content. In order to maintain the list of blocked websites, click on ‘edit block sites list’. A new window will open where you can enter the address of the website and block it. You can get the help on each feature from the developer’s website. Looking for a fast and simple tool to restrict a website? Simple Blocker is the answer to your problems. It is an extension with no fancy features and is just designed to block any undesired website. You can block the sub-domains or complete website using this extension. Install the extension on Chrome and click on the “Simple Blocker” extension on the menu bar. A new window will open with some details explaining how to block a website. Type the address of the website and click on “Save Blocklist” button. The list can easily be managed and you can add or remove sites as you like. There is also a timer option to help in restricting websites during a required time. Above are some of the methods to block websites in Google Chrome. Blocking through hosts file is useful on all browsers on your PC or Mac. However, if you use only Chrome then try to use extensions from Chrome Web Store. Extensions are simpler to use and offer many other options like timer.